The Book of Mormon, winner of nine Tony Awards, will play Atlanta as part of the 2013-2014 Broadway season. The musical from the creators of South Park and Avenue Q will play the Fox Theatre, with dates yet to be announced. The national tour of the blockbuster musical currently stars Gavin Creel and Jared Gertner and premiered in Denver on August 14. “The Book of Mormon” will be coming to Atlanta as a part of the Fifth Third Bank Broadway in Atlanta 2013-2014 season, the presenter is announcing today exclusively in the Atlanta Journal-Constitution. Broadway in Atlanta said that renewing subscribers of the 2012-13 season will be guaranteed seats to the Atlanta premiere; single tickets should go on sale roughly six weeks to two months prior to opening. The Book of Mormon Broadway grossed $1,651,064 and had an attendance rate of 102.6%, same as that of the previous week. The 24 shows on the boards grossed $20,855,107, dropping around 3.17% from the previous week’s totals. The Tony Award-winning hit musical The Book of Mormon launches across the U.S. starting August 14, 2012 with the first preview of the first national tour, starring Tony nominee Gavin Creel and Jared Gertner, at the Ellie Caulkins Opera House in Denver, CO. The show is set to spend the entire 2012-2013 season touring the country, hitting 15 different cities. The arrival of “Book of Mormon” underscores the increasing national stature of Denver Center Attractions, the Broadway arm of the Denver Center for the Performing Arts. The Book of Mormon opened to critical acclaim March 24, 2011, at the Eugene O’Neill Theatre. The production plays a sold-out run in Colorado through September 02, 2012. The musical will play a Denver return engagement in October 2013. A separate Chicago production of The Book of Mormon will begin previews at the Bank of America Theatre December 11, 2012. Click here for the Book Of Mormon Current Tour Dates. Buy Book Of Mormon Ellie Caulkins Opera House Tickets Online, Use SUMMERFUNTN at checkout to save $10 on any Order of $250 or more. The Book of Mormon Broadway grossed $1,634,876 and had an attendance rate of 102.6%, same as that of the previous week. The 25 shows on the boards grossed $22,096,556, improving around 2.19% from the previous week’s totals. The Book of Mormon Broadway Musical grossed $1,633,673 and had an attendance rate of 102.6%, same as that of the previous week. The 28 shows on the boards grossed $23,546,987, improving around 0.53% from the previous week’s totals. The Book Of Mormon Los Angeles Tickets are still available and the top ticket can be had for $175. “Book of Mormon” tickets can sell for nearly $500 at the box office on Broadway and are tough to find. That’s because New York’s Eugene O’Neill Theatre seats 1,100, while the Pantages Theatre can hold about 2,700. In pricing for big tours of popular plays to cities like Los Angeles, demand and ticket prices go hand in hand. Weekday performances currently have the most availability while many weekend shows, especially matinees, have just a few seats left. As scheduled, The Book of Mormon will open the 2012-13 season at the Pantages Theatre September 05 to November 25, 2012. Purchase The Book Of Mormon Los Angeles Tickets online in advance. Buy Book Of Mormon Pantages Theatre – CA Tickets Online, Use SUMMERFUNTN at checkout to save $10 on any Order of $250 or more. Book Of Mormon hasn’t even hit the stage in Colorado yet and theater lovers in Denver are already anticipating the Book of Mormon’s return next year. 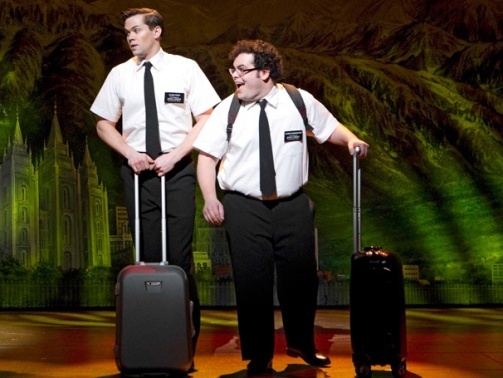 Broadway’s most popular musical, Book Of Mormon kicks off the national tour in Denver August 14, 2012. The announcement Thursday afternoon has created a lot of buzz since tickets to this month’s showing sold out quickly when they went on sale. The Book of Mormon will return to Denver for the performances at the Buell Theatre in October 2013. The change in venue is to allow more people to see the show. Tickets go on sale early next year. Book Of Mormon is all set to start the first tour in Denver, CO on August 14, 2012. Watch Greg Moody’s report – Go inside the Ellie Caulkins Opera House for a sneak peak at the set production of Book of Mormon. Book Of Mormon Ellie Caulkins Opera House performances start on August 14, 2012 and continue through September 02, 2012. Buy Book Of Mormon Denver CO Tickets Online, Use SUMMERFUNTN at checkout to save $10 on any Order of $250 or more. The Book of Mormon national tour will play the Straz Center in Tampa as part of the venue’s 2013-14 Broadway season. “The Book of Mormon,” created by Trey Parker, Matt Stone and Robert Lopez, is religious satire that tells the story of Mormon missionaries who travel to Uganda where they meet all sorts of people that challenge their beliefs. Specific performance dates for the Straz Center will be announced at a later date. Book Of Mormon National tour will stop in Columbus as part of the Fifth Third Bank Broadway in Columbus’ 2013-14 season. People who want to see “The Book of Mormon” can secure seats to a bound-to-be-popular performance by subscribing to Broadway in Columbus’ current season. The performance dates and tickets sale will be announced at a later date.